Oh, Johnny Mango. Why do you torment me so? I love your delicious drinks and vegetarian and vegan bean offerings, but I hate you for leaving Willoughby a few years ago. Maybe it's a good thing that Johnny Mango is more than a short drive away from my house. Otherwise I might find myself there every day enjoying a margarita or a black bean quesadilla. Or enjoying the people watching on the patio. 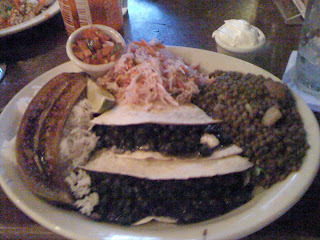 There must be other places around town to get some great food made with black beans around town. I just haven't found them yet. Any suggestions?